An old thought experiment now appears in a new light. In 1935 Erwin Schrödinger formulated a thought experiment designed to capture the paradoxical nature of quantum physics. 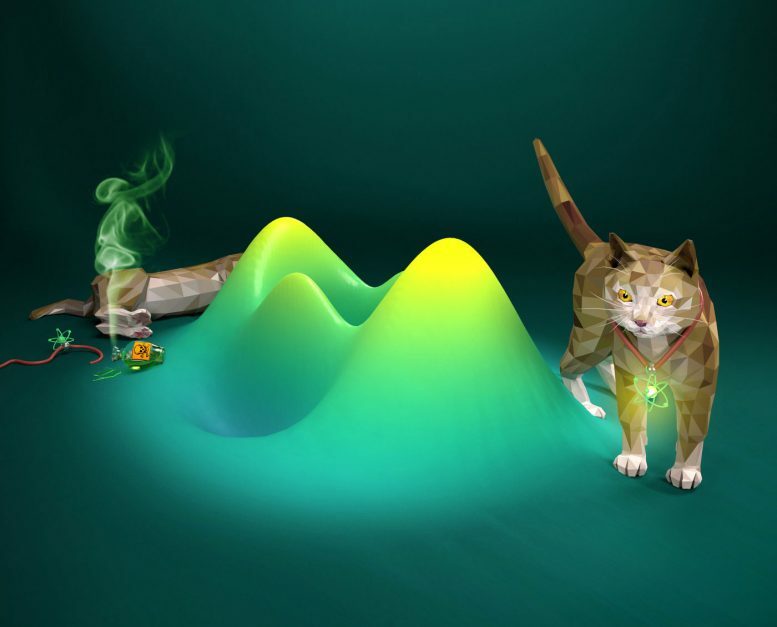 A group of researchers led by Gerhard Rempe, Director of the Department of Quantum Dynamics at the Max Planck Institute of Quantum Optics, has now realized an optical version of Schrödinger’s thought experiment in the laboratory. In this instance, pulses of laser light play the role of the cat. The insights gained from the project open up new prospects for enhanced control of optical states, that can in the future be used for quantum communications. “In our experimental setup, we have succeeded not only in creating one specific cat state, but arbitrarily many such states with different superposition phases – a whole zoo, so to speak. This capability could in the future be utilized to encode quantum information,” adds Bastian Hacker. 1 Comment on "Scientists Realize Optical Version of Schrödinger’s Thought Experiment"
Schrodinger’s cat is a direct conclusion from the assumption that the wave property in the particle-wave duality be the wave of probability. Because of the probability existing everywhere in the universe, a particle could appear everywhere no matter how far the location was. It is indeed difficult to verify the phenomenon experimentally because every measurement would interrupt the wave function. Therefore, the argument is going on and on without definite conclusions. But now we have found that Einstein’s relativity theory is completely wrong (see peer-reviewed publications: https://www.researchgate.net/publication/297527784_Challenge_to_the_Special_Theory_of_Relativity and https://www.researchgate.net/publication/297528348_Clock_Time_Is_Absolute_and_Universal ). The fatal mistake is that Einstein used Lorentz Transformation to redefine time and space and the newly defined time is no longer the physical time we measure with physical clocks. We know the physical time shown on any physical clock is T = tf/k where t is the theoretical time, f is the frequency of the clock and k is a reference frame independent calibration constant. In Newton’s mechanics, f is a reference frame independent constant too. Therefore, we can set k = f to make the clock show the theoretical time i.e. the absolute Galilean time: T = tf/k = tf/f = t.
But in special relativity, frequency is a reference frame dependent variable and can’t be eliminated by setting k = f, thus, T can never be relativistic time t: T = tf/k != t. Therefore, relativistic time is never the clock time i.e. the physical time. On the other hand, when a clock is observed in another inertial reference frame, we have t’ = γt and f’ = f/γ and T’ = t’f’/k = γt(f/γ)/k = tf/k = T, which means that clock time won’t change with the change of the inertial reference frame, Lorentz invariant and absolute. That is, a clock still measures the absolute time in special relativity. As relativistic time is not the physical time we measure with physical clocks, special relativity is wrong. The fact that physical time (i.e. clock time) is absolute has been clearly confirmed by the clocks on the GPS satellites which are synchronized not only relative to the ground clocks but also relative to each other to show the same absolute time and directly denies the claim of special relativity that clocks can never be synchronized relative to more than one inertial reference frame no matter how you correct them. On the other hand, the fact that the speed of light can recover after going through a lens unlike the speed of a bullet which can never recover after going through a wall tells us that light is not particles but waves of some medium we call aether. The Michelson-Morley experiment tells us that aether is not a rigid medium but a fluid. The disproof of relativity tells us that the speed of light is isotropic only relative to the inertial reference frame moving with its medium aether. As light can exist everywhere in the visible part of the universe, aether must exist everywhere in the visible part of the universe too. Since light is “electromagnetic” phenomenon, aether must be the medium delivering all “electromagnetic” forces. Therefore, “electromagnetic” phenomena are just the phenomena of aether dynamics, and there is no such thing called “electric” field in nature, there is no such thing called “magnetic” field either. These “fields” are just lump sum macro effects of special flow patterns of aether. As aether exists everywhere in nature and plays critically important roles in all physical phenomena in the visible part of the universe, quantum mechanics should be wrong too because it has not taken the effects of aether into account. It look clear now that the biggest mistake in modern physics is the denial of the existence of aether. With aether, we know that the motion of a particle disturbs its surround aether to form waves. Therefore, the waves of aether are accompanying the motion of all particles, and the wave in the particle-wave duality should be the wave of aether rather than the wave of probability which is just a mathematical concept not a physical substance and can’t vibrate to form waves. Once the wave of probability is removed from modern physics, then there are no weird conclusions any longer: Schrodinger’s cat, quantum entanglement, etc. With the existence of aether, we have found that everything is understandable without any weird concept.